The battlefield perspective on what transpired that day might have led one to believe that the armies were fairly evenly matched. Joshua and his men fought against the Amalekites. It seemed at times that the Amalekites had the advantage. At other times, Joshua and his army were winning. In the end, of course, the Israelites prevailed and Joshua and his men overcame the enemy. But there is more to life than the obvious, the visible, the physical, or the strength of men and women. There was more to the outcome of this battle than two comparable armies at war, with one in the end demonstrating a better strategy, greater endurance, or more agility. On a hill overlooking the battle were Moses, Aaron, and Hur. At their disposal, they had the staff of God and a rock. 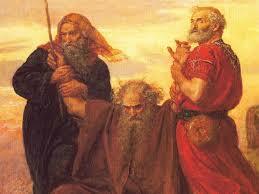 Together, the three men labored to ensure that the hands of Moses (presumably holding the staff) were held high. You see, there was a direct relationship between the position of Moses’ hands and what happened on the battlefield. But let’s take it a step further. Verse 16 tells us that those “hands were lifted up to the throne of the Lord.” Those hands were indicative of the prayerful intervention of Moses on behalf of Joshua and his men. God responded as Moses, Aaron, and Hur prevailed in “prayer.” There was a battle behind the battle. Scripture gives you repeated insight to the reality of that battle, the role that God plays, and the importance of prayer. Unfortunately, it is very possible that the average follower of Christ moves through life as if outcomes depend exclusively upon him/her. Such people necessarily hone their skills, double their efforts, and perfect their strategies. They rise early, stay up late, and worry often. But by acknowledging the battle behind the battle…one fought in prayer…and by recognizing the invisible warrior…the God of the universe…you can rest in knowing that it isn’t up to you! In what situation should you prayerfully acknowledge that now?